This is a beautiful Edmund Dulac fairy tale book illustration for the story called “The Snow Queen. I created this fairy tale card especially for the Christmas holidays using a fairy tale book illustration from the Hans Christian Andersen story, “The Snow Queen”. This story is not about Christmas, but does take place in the winter season. 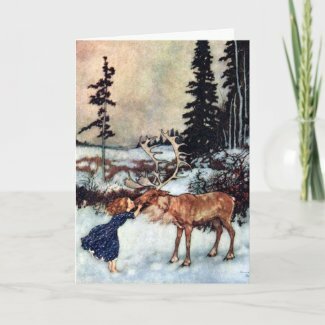 It is a story of hope and perseverance.The illustration features Gerda saying good-bye to the reindeer who has taken her this far to find Kai, her brother, who was held captive by the Snow Queen. The reindeer let her off by the bush with the red berries and said good-bye. The story is about Gerda and Kai’s experience with the struggle between good and evil. It is considered one of Hans Christian Andersen’s best stories. Inside this card is a quotation from Hans Christian Andersen. 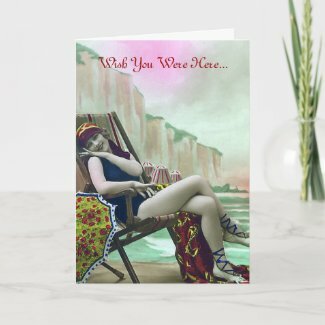 This is a charming vintage art photograph of a woman in a bathing suit sitting along the coast on a beach. I have added an expression of “missing you” but you can insert any text you choose.